One of the important factors in the success or otherwise of a process of starting a new business and helping the entrepreneur to identify business opportunities is social capital. However, the importance of social capital as a catalyst for the recognition of entrepreneurial opportunities has been little studied. Given this importance, it is certainly possible to question the impact of social capital on the recognition of new entrepreneurial opportunities. To answer the various questions raised, a questionnaire-led and administered interview was conducted with 50 entrepreneurs. For data analysis, different statistical methods were used. First, in order to describe the characteristics of the entrepreneurs and companies studied, we use descriptive statistics. Then, we proceeded to the purification of the measurements by using the method of exploratory factorial analysis. Finally, a passage to the selection of the most revealing variables between the groups was made using the discriminant analysis method. Momentum in agriculture (in India) that was gained in 1960s due to the introduction of green revolution started fading away in 1980s and the success story carved began to be hovering around wheat and rice crops only. Later, it was realized that the states which were primarily the beneficiaries of green revolution (Punjab, Haryana, Western Uttar Pradesh and parts of West Bengal etc.) witnessed slow growth in productivity of agriculture due to depleting water table as well as increasing soil salinity and micro-nutrient deficiencies accompanied by rising costs of production thereby leading to stagnating income of the farmers. New farm technology adopted by farmers since mid-sixties required heavy investment of capital in the form of farm machinery, irrigation equipment’s and other inputs like chemical fertilizers, pesticides/insecticides, etc. to maintain pace . Farmers had to spend huge amounts of cash on purchasing market supplied farm inputs and machinery to carry out their production operations . Farmers needed finance for carrying out the cultivation as well as for subsistence. Farmers borrowed money year after year, yet they were not able to clear their loans because the proceeds from agricultural produce failed to commensurate with the amount to be returned . All these factors turned out to be responsible for increasing indebtedness among the farmers and suicides in the farm sector . Thus, Green Revolution of 1960s turned out to be conflict-producing instead of conflict-reducing after almost five decades. Economic prosperity and the lead of Punjab in terms of per capita income is now history and other states have surpassed this long lead. There is growing need to provide respite to the farmers and bring back the lost glory of the state. Accordingly, there is a need to emulate the growth pattern of out shining states of India. In recent decades, different states like Maharashtra, Gujarat, Andhra Pradesh and Uttar Pradesh etc. have brought substantial changes in the pattern of production, consumption, and trade in Indian agriculture. An important change is the shift in production and consumption from food grains to high value agricultural commodities such as fruits and vegetables, milk and milk products, meat, eggs, fish and processed food products. The trade in these high value products is also increasingly displacing exports of traditional commodities such as rice, sugar, tea, coffee, tobacco, etc. Briefly, the study is divided into five sections. Section I is introductory in nature wherein the relevance of food processing industries is highlighted. In section II, database and methodology is discussed in detail. Analysis pertaining to the dominance and growth of Punjab’s food-processing industries is presented in section III. Productivity of food-processing industries of Punjab is discussed in section IV. Concluding remarks follow section V.
A value of M greater than unity implies a positive TFP growth from period t to period t+1 whereas a value of M less than one indicates a TFP decline. Equation above is the geometric mean of two TFP indices. The first index is calculated with respect to period t technology, while the second index is evaluated with respect to period t+1 technology. The advantage of the Malmquist index is that it allows us to distinguish between shifts in the production frontier i.e. Technological Change (TC) and movement of firms towards the frontier Technical Efficiency Change (TEC). The measure of technical efficiency must be between 0 and 1 [16-20]. From 1990 – 2001 and 20% in NVA and Profits from 2000 -2016. Meat Industry shows a growth of only three percent in number of factories from 1980 – 1991, Seven percent from 1990 – 2001, seven percent from 2000 – 2016 and overall growth of around Two percent in the number of factories from 1980 – 2016. Meat Industry shows an overall growth of 16% in NVA and 17% in Profits from 1980 – 2016 [21-25]. Dairy Industry shows growth of around Twenty Eight percent in Net Value added and Profits from 1980 – 1991, around Twenty – Two percent in NVA and Profits from 1990 – 2001 and decline of around 4% in NVA and 20% in Profits from 2000 -2016. Dairy Industry shows an overall growth of 11% in NVA and 3% in Profits from 1980 – 2016. Table shows that there is a growth of 18% in the number of factories from 1980 – 1991, 10% from 1990 – 2001 and only two percent from 2001 – 2016 and exhibited an overall growth of Five Percent in the number of Factories from 1980 – 2016. Manufacture of Grain Mill, Starches and other Starch products and prepared animal feeds industry exhibits a growth rate of around Twelve percent in Net Value added and Four percent in Profits from 1980 – 1991, around Fourteen percent in NVA from 1990 – 2001 and 7% in NVA and 60% in Profits from 2001 -2016. Manufacture of Grain Mill, Starches and other Starch products and prepared animal feeds Industry shows an overall growth of 4% in number of factories, 12% in Output, 11% in NVA and 38% in Profits from 1980 – 2016. Manufacture of other food products industry exhibits a growth rate of around 14% in Net Value added and Five percent in Profits from 1980 – 1991, around 15% percent in NVA from 1990 – 2001 and 3% in NVA and 22% in Profits from 2000 -2016. Manufacture of other food products Industry shows an overall growth of 10% in NVA and 33% in Profits from 1980 – 2016. Table also shows that there is a growth of 6% in the number of factories from 1990 – 2001 and exhibited an overall growth of around two percent in the number of factories and only one percent growth in the number of workers from 1980 – 2016. Manufacture of beverages industry exhibits a growth rate of around 36% in Net Value added and 54% in Profits from 1980 – 1991, around 6% percent in NVA from 1990 – 2001 and 9% in NVA and 6% in Profits from 2001– 2016. Manufacture of other food products Industry shows an overall growth of 15% in NVA and 14% in Profits from 1980 – 2016. Table also shows that there is an overall growth of Five Percent both in the number of Factories and in the number of workers from 1980 – 2016. Above table interprets that Meat Industry shows higher growth than other food processing industries of Punjab. The table 3 shows the market share analysis of different food processing industries of Punjab and its trend from 1980 – 81 to 2015 – 16. The share of Meat, Dairy Industry, Grain, Starch, Other Food Products Industry and Beverages Industry has declined and has witnessed upward and downward trends since 1980 - 81. The above table shows that the Grain, Starch Industry enjoys higher percentage of share than other food processing industries trends of market share of different food processing industries of Punjab and with respect to whole industries operating in the state from 1980 – 81 to 2015 – 16. Meat Industry enjoyed the second position amongst five industries [26-30]. The output-oriented Malmquist indices of productivity change are computed using the DEA. Table 1 presents the mean estimates (geometric means) of Malmquist indices of different Food Processing Industries of Punjab from 1980 -81 to 2015-16 [31-32]. The above table indicates that there has considerable growth of Food Processing Industry of Punjab due to positive growth of TFP (Total Factor Productivity). All the Food Processing Industries except Meat Industry shows negative growth in TEC (Technical Efficiency Change). PTEC (Pure Technical Efficiency Change) for Meat and Beverages Industry remains constant whereas for Dairy, Grain, Starch and other Food Products Industry, it is negative which implies that these industries lack in the learning process. On the other hand, Scale Efficiency for Meat Industry is positive indicates that this industry has increased its productivity by increasing their size. Above results shows that in Meat, Diary, Beverages Industry and Other food products industry, both Total Factor Productivity Change and Technological Change contributed to the growth of overall efficiency. 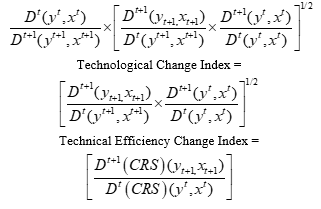 If technical efficiency change index is greater than one, it means that there is an improvement in efficiency or catching-up effect the best practice frontier. On the other hand, if it is less than one it shows deterioration in production performance of the decision-making unit. The technical efficiency change is also decomposed into pure efficiency and change and scale efficiency changes. The scale efficiency change index being greater one indicates the success of cooperative to produce in optimal scale, while pure efficiency change index greater one indicates that there is a learning process in the decision-making unit. Table 5 presents the Total Factor Productivity (TFP) growth and various efficiencies change for both the pre-and post-reform periods in Punjab. The results indicate that the mean TFP for the Meat and Dairy Industry has decelerated in the post-reform period as compared to pre-reform period. TFP change for Beverages, Grain, Starch, and other food products accelerated during post-reform periods as compared to pre-reforms period. The Technological Change of food processing industries shows a positive trend during pre-reform period as compared to post-reform period. Scale Efficiency Change of Meat and Other Food products Industry accelerated during post-reform period as compared to pre-reform period. Technical Efficiency Change of various food processing industries shows more growth in post-reform period as compared to pre-reform period [33-37]. Efficiency and various efficiencies change in the period from 1990 – 91 to 2015 – 16(post- liberalization period) over the period from 1980 – 81 to 1990 – 91(pre- liberalization period) for all Five different food processing industries are presented in Table 6. The results exhibit that the TFP growth in all of 5 industries shows positive growth in the period from 1990 – 91 to 2015 – 16 as compared to the period from1980 – 81 to 1990 – 91. There are only three industries, viz., Meat, Grain, Starch, and other food products, where the Technical Efficiency Change is negative during 1990 – 91 to 2015 – 16. The three major industries meat, grain, starch and other food products industry also show a negative productivity growth during 1990 - 91 to 2015 - 16 over the previous periods [37-43]. It is interesting to find a positive change in technical and scale efficiency in most industries in the post- reform periods over the pre-reform periods. The overall results suggest that the growth of productivity in the post-reform periods is mostly affected by technical progress. Rangi PS, Sidhu MS. Problems and Prospects of Agriculture in Punjab. In RS Bawa, PS Raikhy (edn): Punjab Economy: Emerging Issues, Guru Nanak Dev University, Amritsar; 2000. Shergill HS. Rural credit and indebtedness in Punjab. Institute for Development and Communication, Chandigarh; 1998. Tewari SC. Agriculture Indebtedness in hilly farmers of UP: Indian Journal of Economics, New Delhi; 1969. Anita G, Lakhwinder S. Farmers Suicides and Response of Public Policy. Economic and Political Weekly. 2006; 18: 21-23. Aggarwal AN. Indian Economy, Problems of Development and Planning, Wishva Prakashan, New Delhi; 1999. Ali J, Singh SP, Safdar M. High-Value Agriculture and Structural Changes in Indian Meat Industry: Implications for Agribusiness and Small Farmers. Presented at the Annual Conference of Food Distribution Research Society, Quebec; 2006. Bhargava PK, Salman H. Indian Food Processing Industries – Opportunities and Challenges. Int J Economics and Business Research. 2016; 11: 1. Johl SS. Agriculture Production Pattern Adjustment Programme in Punjab for Productivity and Growth, Government of Punjab, Chandigarh; 2002. Bhatia BM. Indian Agriculture: A Policy Perspective. Also see, Venkateswarlu, B. Dynamics of Green Revolution in India, Agricole Publishing Academy, New Delhi; 2003. Manoj DK, Kabra G, Singh A. Productivity Growth of Manufacturing Sector in India: An Inter-State Analysis. European Journal of Scientific Research. 2010; 44: 3. Desai BM, Namboodiri NV. Development of Food-Processing Industries. Economic and Political Weekly. 2008; 27: 13. Singh DS, Khosla R. Growth and Prospects of Agro - Processing Industries in Punjab. Turkish Economic Review. 2015; 2. Singh GS. Contract Farming Hurts Farmers: Area under Wheat, Paddy Increases. The Tribune, Chandigarh; 2004. Bishwanath G, Kumari A. Import Liberalization and Productivity Growth in Indian Manufacturing industries in the 1990s. (mimeo) Institute of Economic Growth University of Delhi, 2002. Ali J, Singh S, Ekanem E. Efficiency and Productivity Changes in the Indian Food Processing Industry: Determinants and Policy Implications. International Food and Agribusiness Management Review, 2009; 12: 1. Wilkinson J. The Food Processing Industry, Globalization and Developing Countries. Int Food Agri bus Manag Rev. 2004; 12. Joshi MV. Green Revolution and its Impacts. A.P.H. Publishing Corporation, New Delhi; 1999. Johl SS, Mohinder S. The Dynamics of Institutional Change and rural development in Punjab. New York; 1974. Kachru RP. Agro-Processing Industries in India - Growth, Status and Prospects, New Delhi; 2006. Manpreet K, Kiran R. Indian Manufacturing Sector: Growth and Productivity under the New Policy Regime. Int Rev Buss Res. 2008; 4: 2. Gulshan K. Growth Performance and Productivity of Rubber and Plastic Products industry in Punjab. Annals of the University of Petrosani Economics. 2010; 10: 4. Rajiv K, Sharma M. Regional Disparities in Industrial Development in India. Romanian J Regional Sci. 2012; 6: 2. Joaquín MA, Aldaz N. Efficiency and Technical Change in Intertemporal Intersectoral DEA. Journal of Productivity Analysis. 2004. Rais M, Acharya S, Sharma N. Food Processing Industry in India: S&T Capability, Skills and Employment Opportunities. J Rural Development. 2013; 32: 4. Murthy KS, Himachalam D. Problems of Fruit Processing Industry in Andhra Pradesh - A Case Study of Select Units in Chittoor District. Int J Res Commerce Manag. 2011; 2: 5. Catherine L, Richmond J. Productivity and efficiency in the UK: a time series application of DEA. Department of Economics, University of Massachusetts, Boston, New York; 2004. Papola TS, Maurya N, Jena N. Inter-Regional Disparities in Industrial Growth and Structure. (mimeo) Institute for Studies in Industrial Development, New Delhi; 2011. Prasad CS. Economic Survey of India 1947-48 to 2008-09, New Century Publications, New Delhi; 2008. Prasad KM. Four Decade of Indian Agriculture. New Delhi; 1994. Sambasiva RN, Mishra U. Agri - Business Project - An Option for Diversification (Particular Reference to Fruits & Vegetables). Indian Journal of Fertilizers. 2009; 5: 9. Chandrasekhara RN, Dasgupta S. Nature of Employment in the Food Processing Sector. Economic and Political Weekly. 2009; 44: 17. Hazari RK. The Public Sector in India, in E.A.G. Robbinson and Michel Kidron (edn. ), Economic Development in South Asia, London, 1970. Shah SL, Aggrawal SC. Impact of new technology on the level of income, pattern of income, distribution and savings of farmers in central Uttar Pradesh. Indian J Agri Econ. 1970; 25: 3. Shankar G, Jeevitha P, Shahdeesh L. Apprising Techniques of Minimal Processing. Res Rev J Food Processing Dairy Technol. 2017; 5: 4. Sharma KD, Pathania MS, Harbans Lal. Value Chain Analysis and Financial Viability of Agro-Processing Industries in Himachal Pradesh. Agri Econ Res Rev. Himachal Pradesh; 2010. Manoj S, Khosla R. Regional Disparities in India’s Industrial Development: Discriminant Function Approach. Indian J Industrial Relation. 2013; 48: 4. Manoj S, Khosla R. Fruits, Vegetables and Non-Traditional Crop Diversification Analysis in Punjab in the Post Liberalization Period. Punjab Commerce Manag Assoc J Busi, 2014; 7: 2. Sharma VP, Jain D. High-Value Agriculture in India: Past Trends and Future Prospects. Working Paper, Indian Institute of Management, Ahmedabad; 2011. Sanjay S, Sinha S. Small-Scale Fruit and Vegetable Processing: Dynamics of Development. Economic and Political Weekly. 1992; 27: 26. Sehgal S, Sharma SK. Total Factor Productivity of Manufacturing Sector in India: A Regional Analysis for the State of Haryana. Int J Bus Manag. 2011; 1: 4. Singh SP. Centre-State Relations in Agricultural Development. Vikas Publishing House, New Delhi; 1973. Tripathi A, Prasad AR. Agricultural Development in India since Independence: A study of Progress, Performance and Determinants”, Journal of Emerging Knowledge on Emerging Markets. 2009: 1: 1. Stephan T. Efficiency and Productivity Measures across Countries: A Nonparametric Approach. National Association of African-American Studies, Texas; 2000. Table 1: Dominance of food processing industries in Punjab (In Percent). Source: Supplement to Annual Survey of Industries, various years. Table 2: Growth of food processing industries in different time periods (In Percent). Table 3: Market Share Analysis. Table 4: Malmquist Index Summary of Firm Means. Table 5:Total Factor Productivity Change and Various Efficiency Change across the Three-digit Industries. Table 6: Productivity Growth, TP, and Efficiency Change during 1990 – 91 to 2015 – 16 (post – liberalisation) as compared to the period from 1980 – 81 to 1990 – 91 (pre – liberalisation period).